Average Cost of Law School Tuition | Is It Really Worth It? Average Cost of Law School Tuition- Is it Really Worth it? There are many routes that we can take to become successful in life, some are more capital intensive than others. One of these routes that holds a high level of prestige in the eye of most American’s is passing through a big-time University and becoming a lawyer. Maybe this role is more glorified by Hollywood through all the high rolling lawyers that are played by Hollywood actors, could it be however that making the major investment early on in your life could pay off big? We will examine here the average cost of law school depending on what caliber of University you graduate from, and then take a quick glimpse of the compensation you could expect to receive after you have obtained your law degree. For the purpose of this analysis, we will lump the law schools into three categories. The first category is the top twenty best law schools as rated by U.S news Education Grad School rankings. The second grouping will be the following top twenty behind the top twenty, and finally, the third group will consist of the third twenty. Essentially there are three groups of twenty directly in line with no overlap of the top sixty law graduate schools in America. Also for the purpose of this analysis, we will assume that all of the students graduated with a four-year degree from a four-year University at a cost of $19,000 per year which is from a U.S news story in 2010. So after the four years of your undergraduate studies, we will assume the graduate walks away with $76,000 in college debt assuming they all have to borrow every penny. The assumption that all of the people in our study will graduate from the same four-year University can obviously be violated. However, to only judge a single variable at a time, it is important to make the comparison easier to compare. There are some more obvious truths which will be neglected in this analysis which include the prestige level of the undergraduate law program you went to, so we are assuming here you do not need to graduate as an undergraduate from Harvard to get into grad school at Harvard. For our first grouping of the top twenty graduate law schools in the country, the average tuition comes in at $45,569 per year. The averages are calculated taking the number one school which is Harvard, and the number twenty school which is the University of Minnesota Twin Cities and dividing them by two. The figures and school rankings were all gathered from the U.S News graduate school rankings. All of the figures will also assume the out of state tuition fee. According to Berkley University Career Center, it takes on average three years of law school to pass the Bar so that you can become a practicing lawyer. Therefore, the average cost of law school for a graduate of the top twenty law schools in the country comes out to be $136,707 plus their undergraduate degree of $76,000 to be a final total of $212,707. Second, we will analyze the second group of top law schools. The average cost of tuition for this grouping is $38,308 which applied to the same three-year figure would come out to $114,924. These figures were calculated in the same format as described above in the first grouping. Adding back in the $76,000 for the undergraduate degree and you have a total completion cost of $190,924 to go from high school graduate, all the way through passing the Bar. Finally, we will analyze the third grouping of top law degrees in the United States. The average cost of these schools does not vary significantly from the second grouping at $37,500. This would lead to a three-year grad school cost of $112,500, with a total cost of $188,500 to become a lawyer. The following table summarizes the total cost figures from the three different rankings of schools. Also, it must be noted this is purely a tuition cost and does not include the cost of living; this would be too difficult to measure because different towns cost different amounts, and no two people live the same. As the above chart indicates, it could take a large number of loans to be able to complete a law degree from one of the most prestige’s law schools in the country. The question that really matters, however, is how much do you get paid on average after graduating from one of these law schools. According to payscale.com, a Harvard graduate which is a member of our first grouping is paid on average between $49,787 and $234,953 a year to be an Attorney or Lawyer. Also according to payscale.com, the average Boston University Lawyer who is a member of our second group gets paid on average between $45,302 and $160,818. Finally, a lawyer from George Mason University according to payscale.com gets paid on average around $59,958 and $81,488. The following graph represents how long it would take the lowest average paid graduate from each of the groups to pay back their loan assuming they all make a minimum payment of 10% of their salary, and also assuming that their salary does not increase through time. 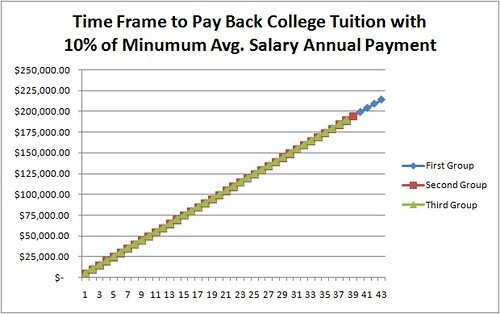 On average if you made the minimum average salary for all of the groupings and paid back 10% of your total salary every year on your tuition loan, and the loan had no interest and your salary stayed consistent, it would take group one 43 years on average to pay back their loan in full, group two 39 years on average to pay back the loan, and group three on average 38 years to pay back the loan. There are a lot of assumptions built into this analysis; however, they are necessary to give a comparable figure. On average group one’s top salary could pay back the entire loan in a single year, however not all lawyers will make it to the top. The average cost of law school is very high, and you need to be in the top of your class and very competitive to even have a shot at one of the top schools. Before you decide that law school is for you, make sure that you realize the time you will need to spend, as well as the possible large financial debt you could occur along the way. Did you pursue your law degree? Do you think it was worth it? Prospective lawyers, please do not underestimate the power of financial aid!!!!!!!! Almost no one pays the full tuition. A 3.0 gpa and a 150 lsat will qualify you for most scholarships. There are hundreds of grants available for women, minorities, interest based, gpa based, volunteer based, children of people who served in armed forces ect. In my entire 1L class of 90% of us got more than half our tuition paid in scholarships. Some gov’t loans are also forgiven after 10 years working in public service. The average lawyer makes 114k (nyc area) not sure what it is in other states. Most schools have an employment rate after school of 92%. The low end of the pay scale starting out is 40k-50k, in 5-7 years you will be making double that (sooner if you speak a 2nd language). Get into a good school, study hard, pass the bar, make your objective from day 1 to be employed and follow that path. Is it worth it? HELL YES. Im really happy I came across this. I’m 19, just graduated from high school in May. Law is also something that I am very interested in. My senior year, I did two separate internships for two different law firms and I loved it. I gained so much experience, and I know it’s something I want to pursue. Well now I’m about to start my third internship at a criminal and family law firm. If I can give any advice, I would tell you to try doing some internships. It’ll give you an idea of what your days will be like and what kind of work you’d be doing in a law firm. I have met many incredible people from pursuing law and I love seeing the progress I’ve made from taking law classes in high school to having internships at law firms and getting to experience court cases from an attorneys perspective! I will tell you, a lot of it is who you know, if it wasn’t for the people I know my second internship would not have been a paid one. I got paid $10 an hour and getting paid for doing something I loved was the best feeling ever! NOW, back to the debt part of things, I was really worried about this as well. The other day I was on the phone with an assistant attorney on the regional counsel and she let me in on a HUGE TIP. If you work for the government for 10 years your debt gets wiped. Now this does mean lower income, but working for the government is a great opportunity. You will meet many new connections and you get to give back to your community. I think this may be the route I take, but you never know what doors will open and what doors will close so I’m keeping a very opened mind on how I get to my goal. If you have any questions or you’re like me and like to challenge your brain with some food for thought, follow me on Twitter and DM me any questions or anything you have. I love talking about law and I’d love to get other perspectives on this! Hi, I’ve read all the comments and they gave me diffrents perspective of how the law school would be. I came to this country just months ago, I learned some english in my other country and now in here I’ve learned a lot more. It’s been hard, given the fact that I’m in my senior year and I’m running out of time to decide what I really want to do. After all the positive and negative that I’ve read about the issue I’m still thinking that law is what I want for me, even if the people say that I have no chance because of my first language or because I’m from other culture. Since I put my feets in this land I realized that the only opportunity that I’ve here is in the studies. I’m gonna work hard, improve myself in all the posible aspects, and in one years maybe less, my english is going to be perfect. I’m really interesting in the law school, I’ll like to know more about it and what can I do to do something relate it to law while I’m still in high school or college. Hey Kaz I’m in need of advice about becoming a lawyer and getting into all that law stuff. I have a myriad of questions! What is your Twitter? honestly I am only 15 years old and I been really into law and defense attorney. I would love to pursue a career in something like this but all these debt seem too long and putting all this work for 5-7 years and maybe wouldn’t be worth in the end is what scares me so I really need help is it really worth it??? I feel the same way. I am 17 and have always been unsure what I want to do but law sticks with me. My opinion is that it comes down to how happy you will really be in the job and what is more important to you? Having a good job or being free of debt? 10% of a $40,000 average salary is hardly a lot of money to pay each year. You could pay much more than 10%. And these calculations exclude the possibility that you could have gotten scholarships for your first four years which most students do. You have to go with what you want in the end, if after everything you hear, you still think it is for you, then go for it. “Great Article! Though I consider degree from reputed collage can assist you, but it in no way can make you gain an extra incentive. The word caliber is golden when you want to ace the top rung jobs. Next are the experiences and its range one has which is given the importance. Even if you manage to get the vied degree from the best college but you don’t have qualities (caliber) to assist that degree you find yourself in cold water. I think one should not get engaged in sheep mentality but follow what is close to heart. The passion and angst is the inspiration then which drives you to meet your goals. There are so many factors that can determine if law school is right for you. I have a few friends from High School that went into law school when they had no right to be there. Now they are sitting with major debt and still living at home at the age of 27. Now others have gone onto great careers, but as you said in your post, they were in the upper echelon of their class. I decided that collage wasn’t the right option for me. At 17 I started my own eBay store and then from their jumped on the internet band wagon. There is so much money to be made online, but one must make the right decision for themselves. Instead of doing the “right of passage” and going to collage, invest that money into a business. Even if it fails, the world experience you gain will be priceless. If your aim is anything but a doctor, engineer, layer, or other specialized skill, get realistic and calculate how much debt you will have by the time you get your degree, and in today’s job market you could be stuck with that for quite awhile. If your aim is an English degree, you may want to rethink your future. If collage wasn’t right for you, perhaps give college a shot?